Ever wonder if residential wind turbines are loud or intrusive? This video should put such fears to rest. The Stella Group, LTD, is a clean energy technology optimization and strategic policy firm specializing in blending clean, distributed energy technologies and financing for commercial, industrial, governmental, institutional, and mixed-use projects. 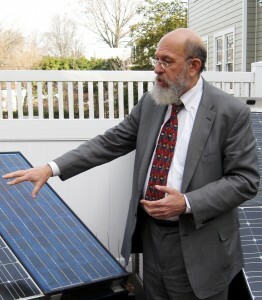 Scott Sklar has forty years of experience in the energy sector, including national military and energy policy as a US Senate aide, technical performance and standards as Acting R&D Director at the National Center for Appropriate Technology, and business/financing running (15 years) the solar and biomass industry associations and his own company for 13 years. Scott Sklar runs a clean energy technology optimization and strategic policy firm, The Stella Group, Ltd, which he founded in 1995 and came on full time to lead in 1999. Read more here.